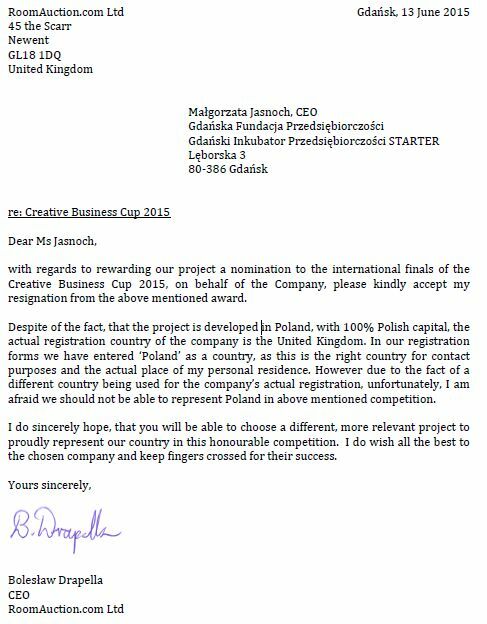 After receiving resignation from RoomAuction.com Ltd company from representing Poland in Creative Business Cup international competition, according to the rules of Startup Contest, the Creative Business Cup prize is handed over to uBirds Sp. z o. o., the next Polish project in the ranking list of InfoShare Startup Contest finals, forming part of the creative industries and meeting the formal requirements of the competition. The resignation of RoomAuction.com Ltd from the award concerning the participation in the international finals of Creative Business Cup will not affect the victory in Startup Contest awarded by the jury in secret voting, organized within the framework of InfoShare Startup Zone. We would like to thank to RoomAuction.com Ltd for quick clarification of questions related to the place of operation of the company and we wish them further success in connection with their winning the first place in Startup Contest competition. At the same time, we would like to congratulate uBirds company and we wish them victory in the final of Creative Business Cup 2015 in Copenhagen. Po otrzymaniu od firmy RoomAuction.com Ltd rezygnacji z reprezentowania Polski w międzynarodowym konkursie Creative Business Cup, zgodnie z regulaminem Startup Contest nagroda Creative Business Cup zostaje przekazana na ręce uBirds Sp. z o. o., kolejnego projektu z Polski na liście rankingowej finałów infoShare Startup Contest, wpisującego się w branże kreatywne i spełniającego formalne wymogi konkursu. Rezygnacja RoomAuction.com Ltd z nagrody dotyczącej udziału w międzynarodowym finale Creative Business Cup nie ma wpływu na przyznane przez jury w tajnym głosowaniu zwycięstwo w Startup Contest organizowanym w ramach infoShare Startup Zone. Dziękujemy RoomAuction.com Ltd za szybkie wyjaśnienie kwestii związanych z miejscem funkcjonowania firmy i życzymy dalszych sukcesów w związku z zajęciem pierwszego miejsca w konkursie Startup Contest. Jednocześnie gratulujemy spółce uBirds i życzymy wygranej w finale Creative Business Cup 2015 w Kopenhadze.